In Sid Meier’s Civilization: The Board Game players can build an entire civilization from scratch. 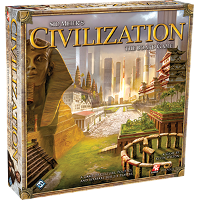 Based on an epic game series created by Sid Meier, this board game lets its players observe the evolution of economy, culture, and military, as well as all the choices that go along with them. Firstly, players choose civilizations they want to play as, and set up the board. After each of the players pick their capitals they can claim starting bonuses (ranging from additional resources to additional armies). Players can then place their army (1) and scout (1) figures on the map in their chosen place. Players set the government system, economy dial and trade dial according to their starting tree and tech tree. Players can trade and collect trade from theiri cities (all players can do it at the same time). Players can take action with all of their cities. Players move their figures a number of squares equaling player travel speed. Players learn new techs (always performed simultaneously). Training in decision making process. Training in policy making process. Building complex interactions with other people. Board game version of Sid Meier’s Civilization. Its second try on creating Civilization board game. The game costs about 30-40 €.